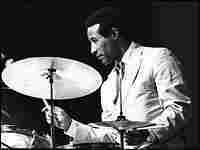 Jazz Legend Max Roach Dies at 83 Legendary jazz drummer Max Roach died this week. He was 83. He got his first break filling in when Duke Ellington's drummer fell ill in 1940. He went on to become one of jazz's most important innovators, creating beats that would take the genre from swing to bebop to the avant-garde. 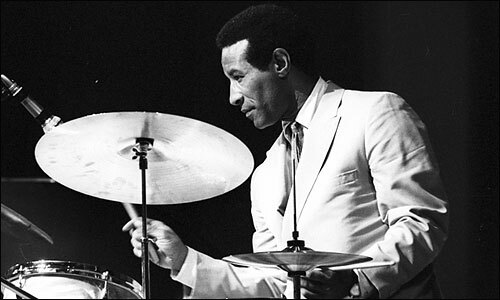 Legendary jazz drummer Max Roach died this week. He was 83. He got his first break filling in when Duke Ellington's drummer fell ill in 1940. He went on to become one of jazz's most important innovators, creating beats that would take the genre from swing to bebop to the avant-garde. Jazz pioneer Max Roach has died. He had an innovative way of playing drums. He used the full kit to create a palette of melody and harmony and, of course, rhythm. And that style helped propel jazz through its most important developments - from swing to bebop to the avant-garde. Max Roach was atypical in more ways than one. He didn't start in a music school or even a regular old jazz band. He got his start at a Coney Island sideshow, as he told WHYY's "Fresh Air" in 1987. Mr. MAX ROACH (Jazz Musician): We used to do sometimes 12, 14 shows a day and we'd have a barker outside. It was a barker who would say come on in, and the girls would go out and shake a little bit and then the public would come in. We'd do, say, 40 minutes. You have 20 minutes off, and they'd go back out. A real sideshow. I enjoyed it. In order to master an instrument you have to do everything. I played with the local symphony orchestra. I played the Coney Island sideshows. I played with marching bands, just - I have drums will travel, so to speak. MONTAGNE: And he played with Duke Ellington's orchestra. Max Roach was still a teenager when he landed a job with that orchestra, but it was his association with another musician that would launch the drummer's career. Mr. ROACH: Dizzy Gillespie heard me on a jam session in a place called Monroe's Uptown House. Clark Monroe was the brother-in-law of Billie Holiday's first husband, Jimmy Monroe. He was like a patron for young talent in these after-hour clubs. These after-hour clubs would open up at four in the morning and go until eight, so we could work those places and still go to school. Bud Powell and a crowd of us. Well, he heard me. He was with Cab, he heard me and said, someday when I get my own band, when I leave Cab Calloway, I would like you to play for me. MONTAGNE: Dizzy Gillespie carried Max Roach into a gathering storm on New York's 52nd Street, a musical maelstrom that the drummer mastered. As Gillespie himself tells it. Mr. DIZZY GILLESPIE (Jazz Musician): He was one of the originators of the style. Max was a leading delineator of that music. MONTAGNE: That music was called bebop. MONTAGNE: Max Roach stood out from other drummers because of his ability to play multiple rhythms at the same time, and as the late Dizzy Gillespie told NPR in 1989, because of his musicality. Mr. GILLESPIE: Aside from being a good drummer, he's a good musician. One thing, he didn't say boom, boom, boom, boom, boom, boom, boom, boom, boom, boom with a base drum. The base drum didn't have a strict four-four beat. It had beats in between, and it's more of a feeling. A feeling of what you do and what you need behind you when you play. He had it. He was just unique. MONTAGNE: Max Roach was like a lot of the other musicians of his era in that he struggled with drugs and alcohol. His first wife, singer Abbey Lincoln, helped him overcome those burdens, and together they took on the social issues of the day. One of their albums, "We Insist! Max Roach's Freedom Now Suite," became one of the benchmarks of 1960s musical activism. MONTAGNE: Roach carried his role as activist onto the college campus, not through protests but through teaching. He was one of the pioneers of jazz education. He kept performing, collaborating with Alvin Aily's dance company, and winning an Obie Award for a score to a Sam Shepard play. And as he did throughout his life, Max Roach continued to push the boundaries of music. Mr. ROACH: You have to change in the business. You cannot repeat yourself if you are - quote - a supposedly creative artist. MONTAGNE: This most creative drummer made his final appearance last summer when he was honored by Jazz at Lincoln Center. Max Roach died this week in New York after a long illness. He was 83. With trumpeter Dizzy Gillespie, Drummer Max Raoch helped create the style of jazz called bop in the mid-1940s. From NPR's 'Jazz Profiles' radio series, hear an entire program on Max Roach, hosted by Nancy Wilson. From NPR's Marian McPartland's Piano Jazz, hear an entire program with Max Roach and bassist Ray Drummond. Max doesn't play fundamental drumbeats behind you just to keep the time going, he's making musical statements at all times. Max Roach was the hottest drummer in New York by the time he was 20 years old. By the time he died at age 83, he was truly one of the giants of jazz. Roach died early Thursday morning in hospice care in New York after a long illness. In addition to being a drummer, Roach was also a composer, a bandleader, an activist and a teacher. He redefined what it meant to be a drummer. Before he arrived, the drum functioned basically as a timepiece. Roach says he made his drums sing solos. "I felt that the instrument itself could be just as vital as any of the others I could think of," Roach said. "And by virtue of the fact that you deal with that instrument with all four limbs, you have four voices you deal with when you think like that." In 1989, Roach described the drum kit as an American invention that combines cymbals from the Middle East, tom-toms from Africa and snares from Europe. His band mate Cecil Bridgewater says Roach's genius was in putting those parts together. "Max doesn't play fundamental drumbeats behind you just to keep the time going," Bridgewater says. "He's making musical statements at all times." Max Roach was born in a North Carolina town founded by freed slaves, and grew up in a rough Brooklyn neighborhood. His mom gave him drums to keep him off the street. But it was on Manhattan's 52nd Street that Roach started experimenting with harmony and melody alongside Miles Davis, Thelonious Monk and Charlie Parker. "We hated to sleep," Roach said. "We'd work 9 'til 9 in two different clubs. We'd spend the day looking for places, working out arrangements on things like [Thelonius Monk's] 'Around Midnight.'" Before his death in 1993, Dizzy Gillespie commented that Roach was a remarkable innovator. "He had terrific ideas," Gillespie said. "And he developed them as we went along. He had the lick for the shtick." Roach founded a seminal quintet in 1953 with trumpeter Clifford Brown. But after just three years, Brown was killed in a late-night car accident. He was only 25. Shocked and grieving, Max Roach buried himself in music, and in the blossoming civil rights movement. In 1960, he recorded an album called "We Insist--The Freedom Now Suite" that featured, among others, singer Abbey Lincoln. It was Roach's answer to the turmoil of the time. Roach continued to speak out for social justice and helped launch the field of jazz studies. His magnet for talent led him into lifelong collaborations with dancers, playwrights, filmmakers and musicians of practically every genre and every country. What seemed to happen whenever Max Roach was around was fearlessness—on the bandstand, in the classroom, and on the streets. The audio version of this story incorrectly said that singer Abbey Lincoln was Max Roach's first wife. She was his second wife.